Dallol Crater: Mud, salt, iron stains, halophile algae, and hot spring activity produce a colorful but dangerous landscape in the Dallol craters. The most recent was formed in 1926 by a phreatic eruption that blasted through shallow salt and sediments to produce a maar. A continuous flow of supersaline hydrothermal water feeds the colorful lakes and alters the original eruption site. Image copyright iStockphoto / Matejh Photography. Afar Triangle: This map shows the location of the Dallol volcanic site in the Danakil Depression of Ethiopia. 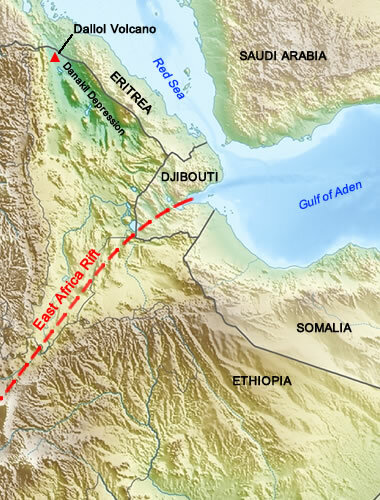 Note how the Danakil Depression parallels the Red Sea. Public domain map from the DEMIS Mapserver, used here under a Creative Commons License. The Danakil Depression is a rift valley that parallels the Red Sea in northern Ethiopia. It is a minor structure related to the rift between Africa and the Arabian Peninsula. As the rift opens, the floor of the Danakil Depression subsides. After millions of years of subsidence, the deepest part of the depression is about 410 feet below sea level. It is one of the lowest points on Earth. Several times during the formation of the Danakil Depression, water has overtopped the divide between the Danakil Basin and the Red Sea, flooding the basin with seawater. Thick evaporite sequences were deposited in the basin as the seawater evaporated in the hot dry climate. Some of the evaporite deposits were formed by evaporating runoff water and evaporating hydrothermal brines. 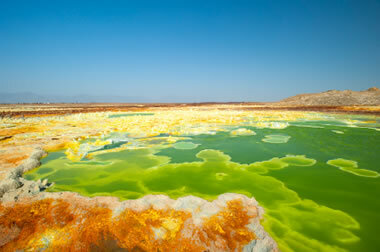 The Dallol area is one of the hottest areas on Earth. The average daily maximum temperature is 106 degrees Fahrenheit and the annual mean temperature is 94 degrees Fahrenheit. 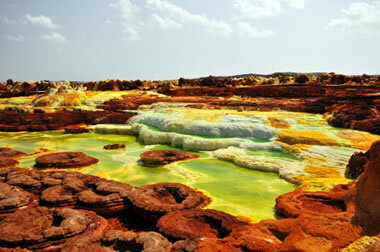 During the rainy season, large portions of the Danakil depression can be covered with runoff water. Terraced salt deposits in one of the Dallol craters, stained yellow, brown, and green. Image copyright iStockphoto / Matejh Photography. Much of the floor of the Danakil Depression is covered by salt flats. Other areas are covered by basalt flows, shield volcanoes, and cinder cones. Several craters up to a mile across can be seen on the salt flats. These are thought to be maars formed by phreatic eruptions. The most recent eruption occurred in 1926 when a body of magma ascended toward Earth's surface in the Danakil Depression near the boundary of northern Ethiopia and Eritrea. The rising magma body penetrated the salt on its way to the surface and a phreatic explosion formed a small maar about 100 feet across at the eruption site. Green lake at Dallol crater: A green lake and salt deposits stained with yellow sulfur and iron in one of the Dallol craters. Image copyright iStockphoto / guenterguni. Dallol, volcano summary on the Global Volcanism Project website of the Smithsonian Institution, last accessed February 2017. Dallol Volcano, article published on the PhotoVolcanica.com website, last accessed February 2017. Dallol Volcano, article published on the VolcanoDiscovery.com website, last accessed February 2017. Dallol has some of the most colorful landscapes on Earth. The hot magma below heats groundwater flowing in from the surrounding highlands. This hot water moves up toward the surface and through the evaporite deposits, dissolving salt, potash, and other soluble minerals. The supersaturated brine emerges through hot springs in the floor of the craters. As the brines evaporate in the hot arid climate, extensive salt formations are formed on the floor of the craters. These are colored white, yellow, brown, orange, and green by sulfur, dissolved iron, mud, and the life activity of halophile algae. The actions of the hot springs, the deposition of salt, and sediments washed in by runoff have modified the geometry of the craters. Dallol craters are dangerous places to visit because their surface can be covered by a crust of salt with pools of hot acid water just inches below. Toxic gases are sometimes released from craters. 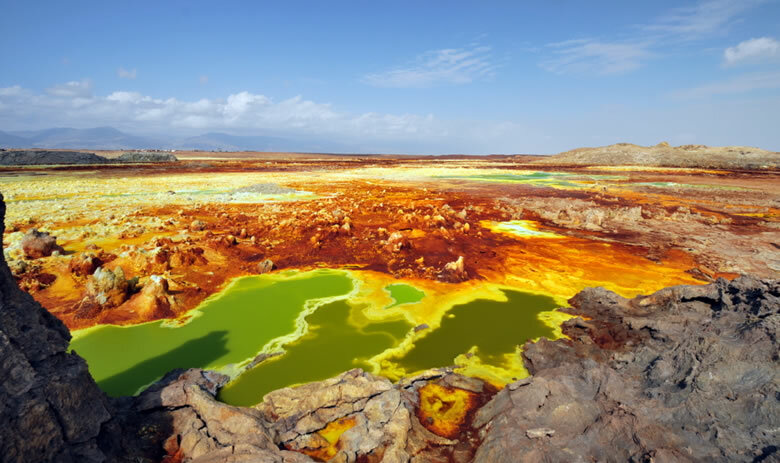 In the past decade Dallol and Erta Ale, volcanic areas in the southeastern part of the Danakil Depression, have been frequently visited by tourists. These excursions can be risky because of the severe climate, the remote location, and repeated attacks on tourists. Armed guards accompany many of the tour groups.